The wealthiest 62 people on the planet now own more than the poorest 3.6 billion according to a new report by Oxfam, and even worse, the richest 1% now own roughly the same as the remainder of the world combined. Take a look at the chart below to see the convergence which has happened over the past 5 years. Even the most died in the wool capitalist can see the system is not working as intended. Wealth is being pulled to the top at a rate which is unprecedented in history and the rest of the stack is moving backwards despite working longer hours and being more productive. We believe the system, capitalism, is the right answer, but is missing a critical component - accountability. Over the past 50 years in particular the world has gone global. This march towards bigger, faster, cheaper, more productive, more efficient, has created incredible innovation and a truly staggering system of global trade, however, it has not come without a cost. 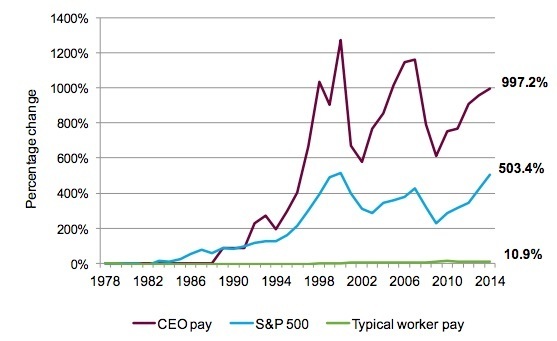 The average worker has seen their pay increase just 10.9% while the average CEO has seen a 997% increase. The worker is clearly a stakeholder who is not well represented in this global economy. You can see the same underrepresentation in the environment in the form of increased pollution, the loss of topsoil, degradation of our water supply, overfishing and more. When we look at the treatment of the community in the form of charitable giving we can see another alarming trend. Take a look at Corporate Profits as compared to Corporate Giving over the past 40 years. As profit margins have increased the percentage of charitable giving has steadily decreased. In the past consumers would hold companies accountable for bad behavior by not purchasing their products. The businesses were members of the community, they played a role and were expected to act with basic humanity. If they were bad actors consumers made a conscious choice to either look the other way or to withhold the lifeblood of any company - revenue. This role of the consumer as a check and balance is absolutly critical to the free market system but has largely been lost because we no longer know the companies we deal with outside of their branding, products and customer service. We must play this role, we must demand more from the companies we spend our dollars with. This is not about government intervention/regulation, raising the minimum wage, or wealth redistribution, it is about the free market working in the way the free market was intended to work. Consumers have an obligation to play their part and we are failing. It is up to us to hold companies accountable, to determine what we will and will not stand for, we simply need a reliable means of doing so. If you agree with this perspective we need your support, we need you to become a Founding Member of GoodWell. If we can get 1,000,000 to show their support for GoodWell, not by signing up for an email newsletter, or signing a petition, but by voting with their dollars and becoming a Founding Member, we will have a powerful voice for change. Please consider taking a leap of faith and taking the first step towards playing your part as a conscious consumer by joining our mission.